Operationalizing Cyber AI: How do we trust it? Today’s cyber security landscape is dominated by talk of AI - but should we really relinquish control to machines? In this webinar, we’ll discuss how to trust AI to combat today’s most advanced cyber-threats and protect our organizations for the long term. Join Andrew Tsonchev, Director of Technology at Darktrace, as he explores what it will take to bridge the trust gap between humans and AI. With trillions of dollars and invaluable personal information housed online, it is little wonder that the financial services industry represents the holy grail for today’s cyber-criminals, having suffered more security incidents than any other economic sector in each of the last two years. And as institutions whose reputations hinge on protecting their members’ savings and privacy, credit unions in particular can ill-afford to employ the same cyber defenses that criminals have consistently bypassed. Cyber AI is a fundamentally different approach to safeguarding the world’s financial assets. Whereas traditional security tools detect only known attacks using fixed rules and signatures, cyber AI systems continuously learn the unique ‘pattern of life’ for each user, device, and network they defend, enabling them to autonomously neutralize never-before-seen threats that cause subtly anomalous behavior. Artificial intelligence has empowered credit unions to finally fight back against their online adversaries. Los ciberataques se han convertido en el riesgo más grande que enfrentan las empresas de hoy, las ciudades inteligentes y la infraestructura crítica. Con un total de perdidas proyectado en un trillón de dólares en el 2019, debido al cibercrimen. En el centro de esta crisis esta el enfoque tradicional para la ciberdefensa, el cual se basa en reglas y firmas para detectar amenazas ya conocidas en un momento donde los cibercriminales lanzan ataques nunca vistas diario. Para ponerse al día con un ambiente en evolución, Darktrace emplea un enfoque fundamentalmente distinto: basado en la inteligencia artificial. Impulsado por los recientes avances en inteligencia artificial. En lugar de predefinir las amenazas cibernéticas basadas en ataques del pasado, el Enterprise Immune System aprende un "patrón de vida" único para cada usuario, dispositivo y red que resguarda. Con esta compresión del “yo,” Darktrace puede detectar de manera sutil comportamiento anómalo e indicativo para amenazas conocidas y desconocidas, dándole la capacidad a los defensores de al fin poder luchar contra los adversarios en línea. -Donde los ciberdelincuentes han encontrado debilidades en los enfoques tradicionales de la seguridad. Listen to Darktrace’s Director of Threat Hunting, Max Heinemeyer talk about the global threat landscape. Explore with him, how cyber AI autonomously responds to threats within mere seconds, helping financial institutions stay protected whenever and wherever a threat emerges. In recent years, attacks on critical infrastructure have plunged entire cities into darkness and caused thousands of machines in nuclear power plants to physically degrade. These essential services are crucial to our daily lives and their increasing vulnerability to cyber-attack risks power failures, environmental hazards and public safety. In response to the growing threats to critical infrastructure, the EU Parliament enacted the NIS Directive in August 2016, with the goal of bolstering cyber security across key sectors. Join Andrew Tsonchev, Director of Technology, Darktrace Industrial, live at 5pm, Wednesday 27th February, as he discusses the implications of the NIS Directive on Operators of Essential Services and the security community. Con la aparición de nuevos métodos de ataque cada día, las organizaciones enfrentan el desafío de defender sus sistemas contra amenazas nunca antes vistas y con una velocidad sorprendente, producidas por un adversario en constante evolución. Además, los mismos empleados aportan otro nivel de incertidumbre a cada organización, de modo que, ¿cómo detectan los equipos de seguridad lo que se esconde dentro de sus propias redes? La tecnología ciber AI de Darktrace ofrece el único enfoque capaz de detectar y responder de manera autónoma a amenazas sutiles y sigilosas en toda la infraestructura digital. • Un atacante sofisticado que filtra datos a través de un casillero conectado a Internet. • Una nueva forma de malware que se propaga lateralmente dentro de la red. As we enter a new era of machine-speed attacks, stretched security teams are hard-pressed to deploy the best technologies to respond to cyber-threats before they do damage. Relied on by hundreds of customers globally, including City of Las Vegas and Trek Bicycles, Darktrace’s cyber AI technology has already proven crucial in autonomously neutralizing subtle and fast-acting cyber-threats. The launch of Darktrace Antigena Version 2 has enhanced its powerful capabilities to fight back against malicious emails before they reach the target user. In this webinar, Darktrace’s Director of Technology, Dave Palmer, will explore Antigena’s newest features and deliver a short demo of the technology in action. In this webinar, Darktrace’s Director of Cyber Intelligence and Analytics, Justin Fier, will explore Antigena’s newest features and deliver a short demo of the technology in action. Michael Sherwood, CIO of City of Las Vegas, explains how implementing Darktrace’s Enterprise Immune System with its autonomous defense capability fundamentally transformed their cyber security posture. With new attack methods emerging every day, organizations are faced with the challenge of defending their systems against never-before-seen, machine-speed threats produced by an ever-evolving adversary. Moreover, insiders bring another layer of uncertainty to every organization – so how do security teams catch what’s lurking within their own networks? Darktrace’s cyber AI technology offers the only approach capable of detecting and autonomously responding to subtle, stealthy threats across the entire digital infrastructure. In an age of borderless networks, security for the cloud and security for the corporate network can no longer be separated. Security teams are now presented with the challenge of monitoring and controlling access to these cloud environments, as they represent yet another frontier for cyber-attacks. Real-time threat detection and complete visibility have never been more important – or more difficult. Join Justin Fier, Darktrace’s Director of Cyber Intelligence and Analytics, as he explores how AI offers the best chance of catching and thwarting in-progress attacks into all parts of a network, regardless of its configuration. El panorama de las amenazas cibernéticas está cambiando. Además de los ataques de alta velocidad, los atacantes de hoy son más sofisticados y están jugando un juego más largo, uno que es silencioso y sigilosos. Su objetivo es interrumpir las operaciones, socavar la confianza o simplemente obtener secretos comerciales al no ser detectado dentro de las redes. Los entornos digitales también están cambiando. El aumento de la digitalización, el aumento de los dispositivos de IoT y la nube significan que los límites de la red son más permeables que nunca. Asegurar el perímetro simplemente no es posible. Para defenderse de las amenazas que evolucionan continuamente, la ciberseguridad del mañana debe ir más allá de buscar al atacante de ayer: debe encontrar lo que no sabe buscar. Las tecnologías de Inteligencia Artificial han conducido al surgimiento de redes de autoaprendizaje y autodefensa que logran esto: detectar y responder de forma autónoma a los ataques en curso en tiempo real. Estos sistemas ciberinmunes permiten que el equipo de seguridad se concentre en tareas de alto valor, puede contrarrestar incluso las amenazas de “machine speed” y trabajar en todos los entornos físicos, virtuales, o cloud. With the US government and European Union issuing rare public warnings of imminent cyber-threats targeting critical infrastructure, how do we know if subtle and advanced threat-actors are lurking in our systems? Silent and stealthy threats can be active on a network for weeks or months, slowly doing damage without detection. These pernicious threats are especially dangerous to industrial environments still reliant on legacy bespoke systems. Industrial Control Systems environments face a myriad of new security challenges such as connected industrial devices, sensors, remote maintenance repair operations, and increasing connectivity to IT systems. How can we combat these challenges amidst an increasingly volatile cyber-threat landscape? Join Darktrace and leading energy companies, Entegrus and Energy+, for a discussion on how AI can be operationalized to secure networks across the energy industry and beyond. With a vast supply of wealth and information, the financial services industry has long been a target for cyber-attacks and data breaches. In a post-Equifax world characterized by evolving, automated threats, stretched security teams, and increased regulations, financial institutions are struggling to stay one step ahead. Join Dan Fein, Darktrace's US Technical Lead, and Chris Sprague, TruWest Credit Union's Security Engineer, as they discuss the security challenges that the financial services sector faces - and how they can be overcome leveraging AI technology. The year of 2018 may very well be the year of ‘smart malware’. As sophisticated threat-actors continue to bolster their toolkits, it is only a matter of time before we see weaponized AI targeting our organizations. Simultaneously, cyber security companies are racing to implement new AI technologies into their cyber defense strategies. We now find ourselves in an AI arms race. Defenders and attackers alike are rushing to stay one step ahead before machines fight machines on the battleground of corporate networks. Amidst this new threat landscape, cyber defense has become a confusing terrain to navigate. What are the actual risks of AI-based attacks? What would an AI attack look like? And how can effectively implementing AI proactively defend against this new era of threat? Join Dave Palmer, Director of Technology at Darktrace, on February 22nd at 9AM PST for a discussion on how AI will shape the next age of cyber defense. 2017 left us with little doubt that attacks against our national critical infrastructure are real. The U.S. government and EU both released rare public statements for energy and utility firms, warning that sophisticated threat-actors are targeting industrial control systems at a never-before-seen rate. Operational Technology (OT) systems present a unique cyber challenge that traditional technologies fail to meet. Reliant on bespoke legacy systems, industrial environments are increasingly connected to IT environments, a challenge compounded by remote maintenance repair operations and connected industrial devices. Darktrace turns the OT security problem on its head, by leveraging AI to identify and neutralize threats to critical infrastructure in real time. 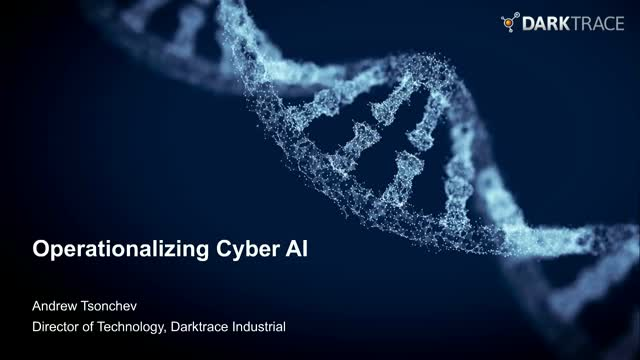 Powered by machine learning, Darktrace’s Industrial Immune System understands the normal ‘pattern of life’ for every operator and device without requiring agents or knowledge of operating system – ensuring that cyber-attacks across OT and IT are stopped before they escalate into a crisis. Join Darktrace Industrial’s Director of Technology, Andrew Tsonchev, and Darktrace’s Head of Security, Simon Fellows, for a discussion on the evolving OT threat landscape, and how immune system technology helps industrial organizations fight back. In an age of cloud computing and connected devices, networks have become more complex than ever before. Security teams now face the challenge of securing cloud environments, IoT devices, and SaaS applications, as well as the standard corporate network. This expanding attack surface has introduced a host of new opportunities for threat actors, from compromising smart TVs and connected fish tanks to stealing data through Dropbox or AWS. To keep pace with these changes, organizations across the world are turning to self-learning technologies powered by AI. Darktrace’s Enterprise Immune System can detect and respond to cyber-threats in real time, while also providing visibility into all corners of the network. With the rise of stealthy cyber-attacks designed to blend into the network, automatically identifying subtle anomalies and threats as they happen has become paramount. Whether malicious or not, insider threat is a major source of problems, breaches and attacks. You cannot guarantee that 100% of your employees or credential holders – however well-educated and well-meaning – will do the right thing 100% of the time. Equally, an insider with malicious intent has the potential to cause almost unlimited damage, given their privileged access and the cloak of legitimacy they operate under. The scope for threat is therefore very broad, and yet often overlooked or underestimated. Join Darktrace’s Director of Cyber Intelligence, Justin Fier, and Director of Cyber Analysis, Andrew Tsonchev, for four real-world examples of Darktrace’s Enterprise Immune System thwarting insider threats, without relying on known threat patterns, rules, or signatures. There is an urgent need for a new approach to combat the next generation of cyber-threats beyond the data center - across Operational Technology, Industrial Control Systems (ICS), sensors and industrial IoT devices. New AI-driven technology is making its way into innovation labs and into production environments within the world’s leading energy, manufacturing, municipalities, hospitals, and construction companies. These network-connected robots, sensors and IoT devices offer improvements in automation, efficiency and even safety, but often lack built-in cyber security. The silver lining is that the same wave of AI that is ushering in these innovations can also be used as an approach to protect them. Darktrace’s AI-powered cyber defense, known as the Industrial Immune System, is used by some of the world’s leading energy and manufacturing companies to detect early indicators of cyber-attacks or vulnerabilities across OT, ICS, sensor and industrial IoT environments. Join Darktrace’s Executive Vice President, Jeff Cornelius, PhD., to learn how Darktrace’s self-learning technology can be leveraged to help defend digital supply chains and ICS environments from cyber-attacks. Join Darktrace’s Director of Technology, Dave Palmer, as he gives an exclusive preview to the newest capabilities of the Enterprise Immune System, including enhancements to autonomous response and ‘automating the analyst’. Title: Operationalizing Cyber AI: How do we trust it?